Stale Gum: The Worst Autograph I've Ever Seen in My Life. You want to know why collectors everywhere hate manu-crap-tured letter patches? Well, other than the fact that the whole concept is stupid. That goes without saying. Take a look at that autograph. Nothing personal against Mr. Ka'aihue, you did your best. But try signing your name 1000 times across an small and uneven surface. 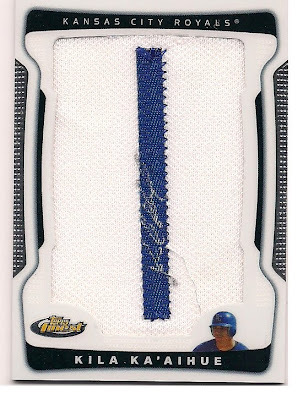 From what I've heard through the grapevine, Topps is reconfiguring Finest for 2011 -- which is why you haven't seen the sell sheets yet. Let's all hope they start by dumping this abomination.